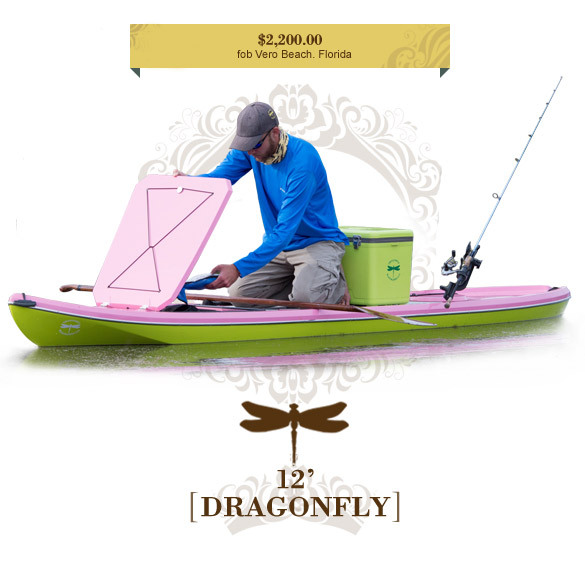 As fishing from a paddle board continues to evolve, the crew at Dragonfly Paddle Boards has been busy designing a board just for the hard-core angler. The “I’m here to fish” purist. Let’s call it frill-free fishing. It’s here and it’s new and here’s how we did it: Using a twelve-foot hull we added two cubic square feet of forward dry storage (insulated for cooler use) and aft-wise a small circular well (pump is optional). To keep your feet and line and fish safe, we installed three flush-mounted rail systems. You can modify the board at will by choosing from an assortment of accessories…rod holders, camera mounts, etc. The board has a length of twelve feet with a thirty inch beam and is hand-crafted of vinyl ester resin with bi-directional fabric. And, need we add, the same quality that goes into all Dragonfly Boatworks’ products, goes into yours. Count on it: Building One of a Kind, One at a Time. Bi-directional glass and vinyl ester resin. Board weighs approx 40 pounds. hull to deck glued and screwed.